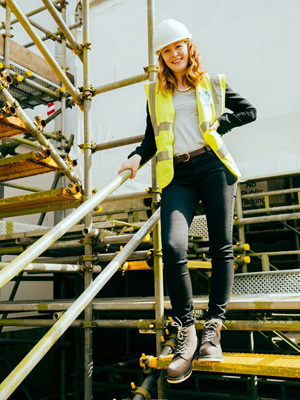 Earlier this year Womanthology began working with Dr Martens and embarked on a Twitter search for three Industrial Champions to mark the launch of the new Dr Martens’ Womens’ Industrial range. We loved reading your tweets where you told us about your industry and how you #WORKDIFFERENT. You also told us how concerned you are that women should have equal access to high quality personal protective equipment. So, here’s a reminder from Jon Marchant, Global Category Director at Dr. Martens, about the importance of educating both employers and employees across all sectors on the dangers of poor quality and inappropriate boot style selection. Slips and trips are the most common source of injury at work, causing, on average, 40% of all reported major injuries1. Despite being a key reason for injury, slip and trip accidents are often perceived as minor, and considered to be an everyday unavoidable occurrence. The chance of these accidents occurring, dramatically increases where the floor is likely to come into contact with water, oil or grease, including kitchens, garages and construction sites. Under the Management of Health and Safety at Work Act 1974, employers are legally obligated to ensure the health and safety of all employees and anyone affected by their work; this includes helping to prevent the chance of slips and trips. As well as ensuring any spillages are sufficiently cleared up, many misfortunes could be avoided simply by selecting more appropriate footwear. When deliberating what footwear is suitable, the most important consideration is working conditions. Are internal steel or composite toe caps required? Would slip-resistance, anti-static or water resistance features benefit the wearer? The Management of Health and Safety at Work Regulations 1991 states that all employers are required to assess potential risks, including slips and trips, and take action where necessary. 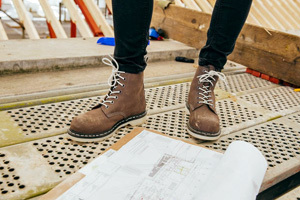 Conducting a risk assessment for the work environment is the most efficient way to determine which footwear would best suit employees, such as a kitchen setting would need to focus on slip resistant boots, compared to those working on a construction site, who would require internal steel or composite toe caps. It is essential employers and employees take time to do research when purchasing work footwear as not all slip-resistant boots may be suitable for all conditions. For example, footwear that performs well in wet conditions might not be appropriate for oily surfaces or surfaces where there have been food spillages2. Footwear trials should always be put in place before supplying a workforce with the most appropriate footwear, to ensure that all workers are happy to wear them over the course of a full working week2. It’s important not to purchase footwear based on brochure information or lab tests alone; conduct in house tests too. 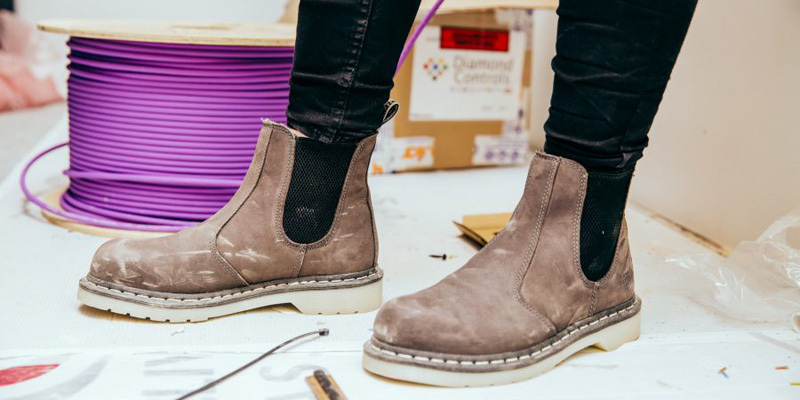 Trials aren’t just carried out to test the quality and effectiveness of the product, although that is important, but they also help determine whether employers find the boots comfortable and workable. If they don’t, it’s possible they may not wear them at all, further increasing risk. Before purchasing work boots or shoes, check with the supplier how the product has been tested for slip resistance – this will help determine if they’re suitable. Suppliers can also conduct additional slip testing if commissioned to. These additional tests allow employers to see how the product fares against their own surfaces or substances, which is particularly important for those who work with specialist oils and chemicals. Not all employers supply their workforce with footwear, however, they should still be advising and recommending specific boots types to employees, taking into account working conditions. Some brands offer specific footwear to suit different industries including a water-resistant range, a heavy-duty range or a slip resistant range. Similarly, if employees have any concerns or queries about which industrial boot they should choose, they should raise them with their employer before purchasing. When it comes to footwear, the cost certainly affects the quality. An £80 pair of boots will offer much more protection compared to a £20 pair of boots. It might seem excessive at first to spend more than the average on a pair of work footwear, however, it’s vital to remember that these products have been specially developed to prevent life altering injuries, meaning the benefits are priceless. It’s also worth buying boots from PPE experts rather than a high street retailer as the advice available is invaluable.